This Herb Butter Grilled Filet Mignon is the perfect centerpiece for a date night dinner, easy weeknight meal, or backyard entertaining. This 30-minute meal is complete with grilled vegetable kabobs and a glass of Cabernet Sauvignon. Date Night Dinner in just 30 minutes! Whether you’re planning a date night in or you are backyard entertaining with friends, this amazing (but simple!) Herb Butter Grilled Filet Mignon is what you want at the table. Best of all, this restaurant-quality dinner is a 30-minute meal complete with side dishes and you don’t have to heat up the kitchen at all since everything is cooked on the grill. The herb butter is homemade to give these steaks that wow factor you need to impress anyone. Since we all know you can’t serve just steak for dinner – no matter how good it is – let’s talk about the perfect pairings for this melt-in-your-mouth Grilled Filet Mignon. Grilled veggie kabobs with bell peppers, onions, squash, and mushrooms add the perfect freshness to this meal and you can use whatever fresh produce you have on hand. If you want to keep the meal light, a nice tossed salad would work great as well. If you’re perfectly fine with a little overindulgence now and again, go with a cheesy twice baked potato for a hearty side option. Don’t forget the Cabernet Sauvignon! It’s the perfect way to round out this meal. In a medium bowl, combine 2 sticks of softened butter with chopped herbs. Place on a piece of plastic wrap or waxed paper and form into a roll. Wrap tightly and place in refrigerator for at least 2 hours. Twenty minutes prior to grilling, remove steaks from refrigerator, pat dry, sprinkle them with another round of coarse salt and grind a little pepper over them. Let them sit on the counter to bring them to room temperature. Preheat the grill to a temperature between 450-500ºF. Grill steaks for 4-6 minutes per side depending on thickness. 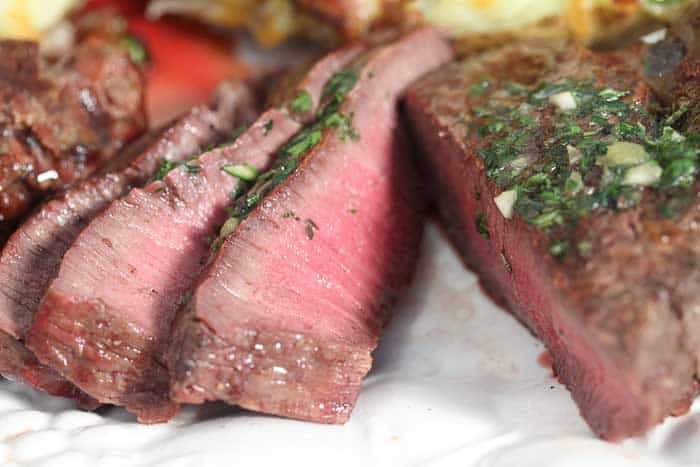 For medium-rare, take off the grill when temperature reaches 125ºF. Top each filet mignon with a 1/4" slice of herb butter and let rest for 10 minutes to allow the juices to redistribute throughout the meat. Home Chef Tip: Homemade herb butter can be made up to a week ahead of time and used on all sorts of meats, seafood, and vegetables. We hope you enjoy this Herb Butter Grilled Filet Mignon dinner from 2 Cookin’ Mamas, as much as we do. If you love this recipe and you’re looking for more like it, visit the The Fresh Market site. For daily recipe inspiration, subscribe to our newsletter, like us on Facebook, and follow us on Pinterest. Enjoy!